In this last (but certainly not final!) 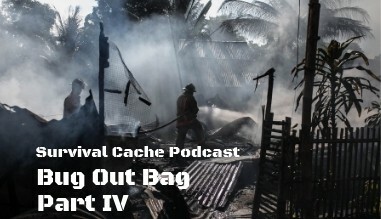 episode in the four-part Survival Cache Podcast discussion on Bug Out Bags, Doc Montana and Drew discuss security and introducing weapons and associated accessories to your Bug Out Kit. Knives and cutting implements, pistols, 10/22s and ARs, pepper spray, and other items are discussed, along with touching on ammo, optics, and other considerations you may want to consider in your BOB – especially if you’re prepping for a long-term event. A fun episode with lots of opinions – download, listen, and chime in on the topic! Doc and Drew invite you to discuss and debate, via email: podcast(at)survivalcache(dot)com!